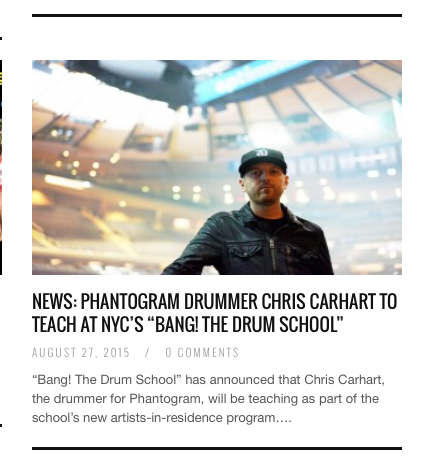 Modern Drummer writes about Phantogram’s Chris Carhart and BANG! It was exciting to see that Modern Drummmer magazine picked up on the story about our new Artists-In-Residence program and the fact that Chris Carhart, PHANTOGRAM’s drummer, is our first appointment. There is a great shot of Chris at Madison Square Garden and a quote from me (Mark Feldman) included in their News story. For those of you not familiar, our new program is bringing teachers like Chris, who have international recognition, to our NYC studios so that we can continue to teach drumming and spread the gospel about the world’s most fun instrument to play. You can read Modern Drummer’s entire piece by following this link to the Modern Drummmer website: Click Here!